The CSV export tool will allow you to import your expenses into your invoicing, payment or accounting packages. If you haven't added a CSV export format to your account yet from the Admin area, you will need to do this before you can export your expenses. Please have a look at our Add Export Formats help article before continuing. When you are ready to export your expenses, navigate to the Finance area. You can export expenses in both the Approved section and Completed section. If you are looking to import your CSV file into an accounting package, we recommend exporting to CSV from the Approved area and ticking Marked as Paid/Reconciled. This will stop you from importing into your accounting package twice. 2. Select the expenses that you would like to export to CSV. You have lots of filters to break down the expenses in the Approved area and lots more in the Completed area. 3. You can select the expenses individually or tick Select All. 4. Click the Export dropdown and choose either Export All or Export Selected. 5. Give your CSV export a name. 6. From the Format dropdown, select the export format you wish to use when exporting the expense information. 7. 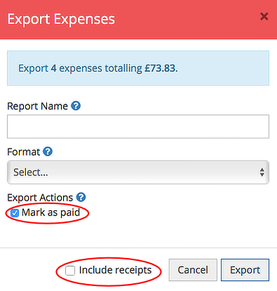 If you are exporting your expenses from the Approved section (and depending on the Finance configuration in Advance Settings in the Admin area), you have the option to move the expenses to the Completed area by ticking either Mark as paid or Mark as reconciled. 8. Tick Include receipts if you require a copy of the receipts. This will download a separate folder that contains the digitalised receipts. Your CSV file will now start to download.